The major problem I've run into is that there are two kinds of genealogy when it comes to gods. One might be termed familial genealogy: Zeus and Hera are the parents of Ares, Odin is the father of Thor, etc. This is "genealogy" in the same sense as it's used for actual people. 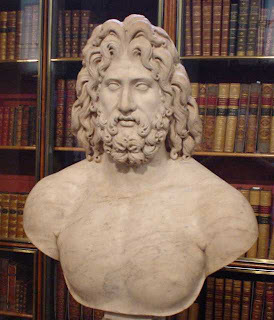 Bust of Zeus from the British Museum. The other might be termed cultural genealogy. This follows etymology fairly closely. As an example, Jupiter, the name of the chief god of the ancient Romans, is a contraction from something like Iou Pater, meaning "Jove the Father". The name Iou/Jove, in turn, descends from *Dyeus, the reconstructed name of the patriarchal sky god of the early Indo-Europeans. (The asterisk before the name indicates that it is reconstructed, not known from documents.) This name and its associated god were also inherited by other Indo-European cultures: *Tiwaz of the ancient Germanians (whence "Tuesday"), Zeus of the ancient Greeks, Dyauş Pitār of the ancient Indians, etc. 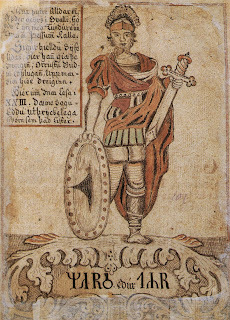 Týr, an Icelandic variant of *Tiwaz. The ancestry of our own generic word, god, is a bit murky. All of the Germanic languages have some form like god or Gott or guth, but none of the other Indo-European languages have such a word (with the possible exception of Farsi khoda). Perhaps its origins are from some obliterated "Old European" language. But a possibly more likely explanation is descent from the proto-Indo-European root *gheu-, meaning "to invoke", "to pour", or "to offer sacrifice". If so, it may not descend from any god's proper name. But with the advent of Christianity in Europe, god underwent the exact opposite transformation that *Dyeus had undergone. It diversified, going from being a general term to becoming the proper name of a deity: God, the patriarchal deity of modern Christianity. This usage was, of course, inspired by the usage of the generic Latin word deus to signify the supreme deity. Indeed, from a purely etymological standpoint, Jupiter and Deus Pater ("God the Father") are the same thing! Clearly, though, Roman Catholic priests are referring to something different from the chief Olympian god when they invoke Deus Pater. These supernatural figures have many things in common: power, masculinity, an association with the sky, etc. But they are different in other respects. Jupiter leads a pantheon of other gods, many of them his relatives. Deus Pater acknowledges no other gods, and his court is run by lesser beings (angels, kerubim, serafim, etc.) which bear no familial relation to him. Jupiter consorts with humans, even mating with them (lots of them). Deus Pater is asexual. Jupiter can be tricked, incited, enraged. Deus Pater is clear-headed, omniscient, and without fault. But a look into Deus Pater's conceptual ancestry shows that those differences are fairly recent inventions. The Christian idea of a single god was, of course, taken from the Judaism. The Judaeans worshiped a single god, Yahweh, with many of the same attributes as the Christian god: wisdom, power, asexuality, etc. Early Christian sects were divided on how to interpret the single god (or, indeed, if it should be single), but the view that won out was sort of a beefed-up version of Yahweh (also known as Jehovah, thanks to an interesting clerical misunderstanding that I may go into another time—or you could just look it up). So where did Yahweh come from? By the time of the early Christians, he was actually already an amalgam of earlier deities. The amalgamation process began during the Assyrian Empire. When the Assyrians conquered the coastal land of Canaan, they forced many of the Canaanites into exile. A good number headed into the wild highlands occupied by the Judahites, where they were safely out of reach. These Canaanites became known as the Israelites, or Yishra'eli, the "people of 'El", 'El being the name of their chief, patriarchal god (whence my middle name Michael, "next to 'El"). The Judahites, or Yahudi, by contrast, worshiped Yahweh. Since the Yahudi and the Yishra'eli spoke similar West Semitic dialects, their cultures merged, eventually becoming synonymous. As the cultures merged, the gods merged, too. The Canaanite religion is well-attested from an early (i.e., pre-Biblical) time. The chief god was 'Il or 'El, and he had many sons called the 'Ilohim or 'Elohim. Chief among these were Haddu/Hadad (also considered the son of Dagon, and frequently referred to with the honorific Ba`al, meaning "lord"), the god of the sky; Yamm (later dubbed Yaw), the god of the waters; and Mot, the god of death (his name also literally meaning "Death"). 'El's consort was 'Athtart/Astarte/Asherah. This is all necessarily simplified, since various ancient Middle Eastern traditions related these gods to each other a bit differently. 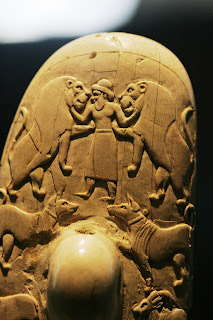 'El and various beasts adorn the Gebel-el-Arak knife hilt. 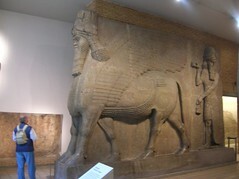 Sumerian/Akkadian lamassu, the general sort of creature Yahweh would have employed. From the British Museum. In English translations of the Tanakh (the Old Testament), the chief deity is variously referred to as God or LORD or the LORD of Hosts or God Almighty or the LORD God. This reflects several names in Hebrew. God generally refers to 'Elohim (a plural!) or, more rarely, 'El. LORD always refers to Yahweh. God Almighty is the honorific term 'El Shaddai., and the LORD of Hosts is the honorific Yahweh Tsaba'ot. Thus, parts of the Old Testament with the word God are of Canaanite (i.e., Israelite) origin, while parts with the word LORD are of Judahite origin. The awkward combination LORD God reflects a later redaction of originally Judahite sources, a latter-day attempt to secure the synonymy of the two cultures' gods. They hadn't invented parenthetical markers (or, indeed, any punctuation) when these texts were written, but if they had, they might have written it as Yahweh ('Elohim) instead. 'Elohim, by the way, sometimes is translated correctly as a plural (gods), wherever it is obviously referring to multiple entities. 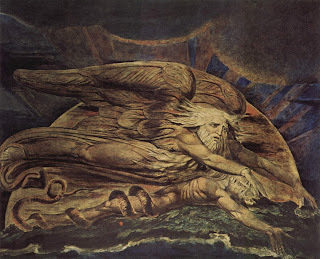 Depiction of a singular 'Elohim creating 'Adam, by William Blake. In the Tanakh, particularly in the Judahite texts, you can see that the modern Christian God comes from a rather different source. Unlike God, Yahweh is fallible. He regrets his past actions (as in the various versions of the Noachian saga). He can be brought to change his mind (as in the various versions of the Mosaic saga). He has a temper, and it often erupts in genocidal demands. He demands fealty, even unto the killing of firstborn sons (in the pre-edited tale of Isaac). The Israelites and Judahites worship him not because he is perfect, but because he is strong, and will smite their enemies if they cleave to his demands. The differences between Jupiter and Yahweh begin to dissipate. 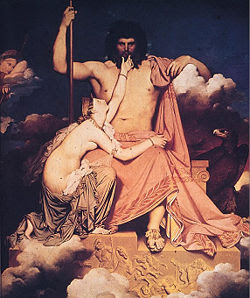 Jupiter gets some attention from Thetis, by Jean Ingres. So, like many cultures, ancient Semites and ancient Indo-Europeans revered mighty, patriarchal chief gods. These chief gods lead pantheons of lesser gods. They sometimes made mistakes. And, while often generous to their followers, on occasion their behavior can be described in no other way than evil. (Indeed, some early Christian sects believed Yahweh to be an evil deity, inferior to the beneficent 'Elohim.) In essence, these gods were big, powerful men, not the ethereal, cerebral force that 'Elohim and later Deus Pater became. As the civilizations evolved, so did the gods. By now it should be clear that tracing these divine genealogies can get pretty complicated. My attempts to synthesize a nice, clear chart have so far failed. But I'll keep at it. Archaeology makes it abundantly clear that even monolatry was rare outside of the temple before the Babylonian exile, and there was little reason to question the existence of other gods (even if you didn't worship them) as long as polytheists continued to rule your world. It seems probably to me that the consolidating proto-orthodox Christian church invented the idea of monotheism (or rather derived it from a popular form of neo-plantonism which itself was convergently hitting on parts of Atenism) in the 4th century A.D. as Christainity gained offical state status under a sympathetic emperor. In the following centuries the intellectual atmosphere (such as you could call it in Europe) promoted monotheism as the obvious standard (with potentially deadly repurcussions for disagreement) and I'd guess that is when the idea cemented with the Jews as well. So ironically, Judaism may have learned monotheism from (4th-5th century) Christianity, not vice versa. Dammit, I know I replied to this earlier. Anyway, yes, what you say seems pretty likely. Like so many issues, monotheism vs. polytheism is more of a gradient than a yes/no question. Strict monotheism is even younger. I'm told there are still fundies in the USA who hold to the ancient Christian view: other gods are actually evil demons whom to worship is positively dangerous, but they still exist. The similarities between the Semitic and the IE chief gods go even farther: association with mountains and thunderstorms, but not with the sun. I wonder if the Semitic one comes from the Hittites (...who did not use an IE name, but a Hurritic one: Urhi-Tesup/b). I think a lot of fundies don't think about it too much. I was raised in a sort of eclectic American Christian environment, and it doesn't seem strange to me that some people would hold those views and still think of themselves as monotheists. Very interesting idea that the link between 'Il and Dyeus may go back further. Borrowing from the Hittites would make sense, or perhaps even inheriting from a common ancestry. Doesn't seem like we have a great chance of ever knowing, though. Ah, now I see -- the thunder god was Teshub (a.k.a. Tarhunt), and "Urhi-Tesup" must be a theophoric name. Wittily, when asked if anyone else was involved in our creation she admitted that there was another part, which she called the part-en-er or the did-yous-part-er (Deus Pater).